An inspired dynamic score makes for some sublime hiking, but its somewhat slim and repetitive for the asking price. 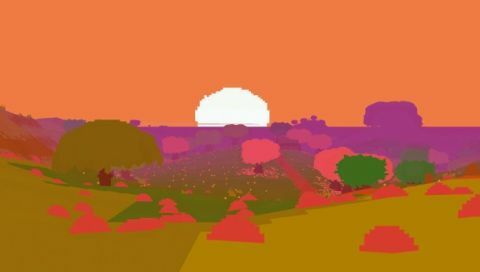 Proteus is a peaceful first-person exploration game set on a cheery pixellated island. There are no enemies. You can't die. You can't jump, shoot, dodge or pick anything up. Your only objective is to roam, observe and enjoy the evolving soundtrack triggered by your path. You'll encounter more danger doing a lap of Kew Gardens than exploring Proteus's serene, procedurally generated world. Once you've spawned at sea and wandered ashore, you can start getting a feel for the island's layout. Every playthrough rearranges a series of geographical elements that you'll come to recognise, like an abandoned shack, some mysterious ruins, and a strange circle of stone animal carvings that regularly grace the peak of one of Proteus's easily scaled mountains. By day, there's no purpose to your exploration. At night, you'll discover a delightful way to shift the island to its next phase, which I won't spoil. The change alters the island's weather, colour palette and wildlife, and evolves the soundscape. If you have a decent pair of headphones, plug them in for Proteus. The island responds to your rambling with a deeply satisfying emergent arrangement. The hop and flutter of Proteus's creatures is accompanied by an electronic riff. The hoot of a digitised clarinet serves as the call of an owl. Flies swarm to the scattered notes of a frenzied cyber-fiddle. Rain falls in cascading chimes. I charged into the midst of every gaggle of monsters and absorbed the resulting wall of sound with childish glee. The joy faded in the latter stage of Proteus's 45-minute arc. The creatures that make the first half feel so busy and interesting become increasingly sparse. I found myself walking aimlessly, unstimulated and bored. Proteus's bubbling symphony has a disappointing coda, and you may feel shortchanged by its length. The procedural generation offers a reason to restart, but the island felt deeply familiar in my playthroughs. Players on Proteus's forums mention a couple of surreal, well-hidden secrets, but my experience each time was largely identical, and I found no deeper meaning or binding narrative to the island's mysterious landmarks. Proteus is mood music. If you're looking for a soothing green oasis to return to every now and then, this will do the job nicely.